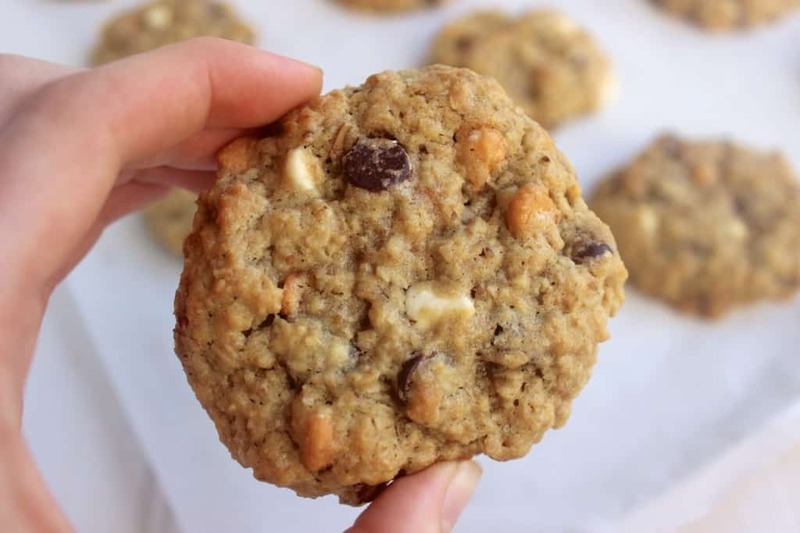 Soft and chewy oatmeal cookies with semisweet chocolate chips, white chocolate chips, almonds, walnuts, and butterscotch chips. 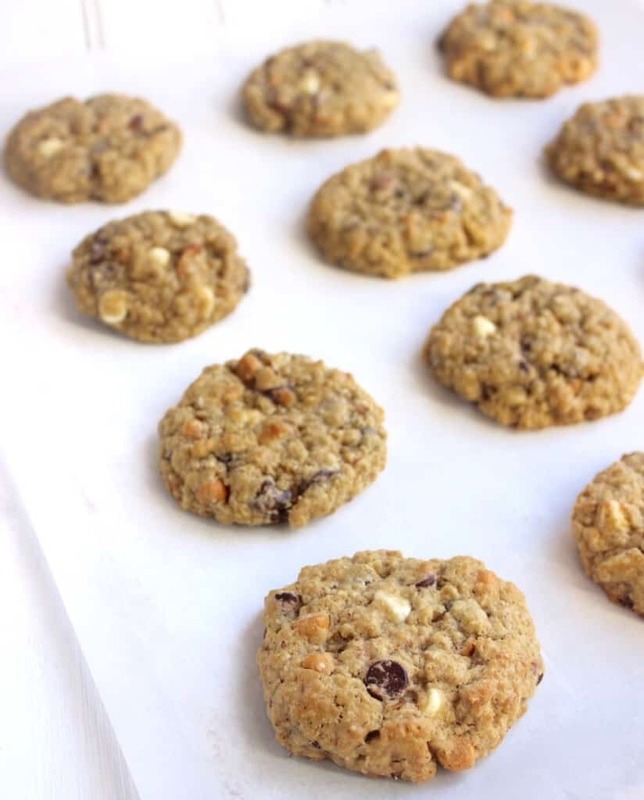 PSA: Don’t be fooled by this recipe appearing on “Healthy” Liv– there’s nothing necessarily healthy about these cookies, unless you do some so-called “girl math” and decide that the oats and almonds in these cookies make them practically an appropriate breakfast food. Or you could say these cookies are healthy for your soul or something. I’ve tried my fair share of healthy cookies recipes, and none have come close to the real deal, so I’ve decided that when I bake cookies, I’m using butter, sugar, and chocolate. That way, I can share them with friends and family members who aren’t thrilled about the idea of stevia-sweetened protein powder banana cookies. (Because, honestly, neither am I.) I’d much rather enjoy just one or two extra-delicious cookies rather than eat an entire pan of low-calorie or low-sugar cookie posers. I actually haven’t shared a cookie recipe since my favorite soft chocolate chip cookie recipe back in April, so I thought it was time. Although I like to mostly share healthy recipes with you, like my sweet potato & chickpea stew and kale chips, cookies are definitely a part of my life, too. During almost every summer growing up, my extended family would spend a week staying at a house in Hilton Head Island, SC. My mom would send my grandpa and me to the grocery store with a list since we both enjoy grocery shopping. Every grocery trip with my sweet-tooth grandpa was an adventure. We’d usually come back with all of the necessities on the list, and we’d always pick up a few extras, too. Usually, the extra goodies included a few pints of ice cream or a box of kitchen sink cookies from Fresh Market. I love the idea of a cookie with a ton of different mix-ins, so I adapted my favorite oatmeal cookie recipe and my favorite Neiman Marcus cookie recipe to create a base for my own kitchen sink cookie recipe, and then I added some butterscotch chips, semisweet chocolate chips, white chocolate chips, almonds, and walnuts, in addition to the quick-cooking oats. I’ve seen kitchen sink cookie recipes that also include crushed pretzels, crushed potato chips, chocolate-covered almonds, peanuts, peanut butter chips, and more. The possibilities are endless! And of course, these cookies are super soft and chewy because I’m firmly on team soft cookie. Hope you enjoy! In a large bowl or stand mixer, beat together the butter and brown sugar. Add eggs and vanilla and mix until smooth. Add the flour, baking soda, and salt and mix until just combined. Stir in the oats and the rest of the mix-ins. Heat oven to 350°F before you scoop the cookies so that it’s fully heated when you’re ready to put them in. Form the cookie dough into heaping tablespoon balls about 2 inches apart on a parchment-lined baking sheet. Flatten the cookie dough balls with the back of a spatula. Bake cookies for 9-11 minutes, taking them out when barely golden at the edges. Let cookies cool on the baking sheet for a few minutes before transferring them to a cooling rack. The longer I bake, the more I agree! Desserts just need to be special and not full of healthy substitutes! Otherwise, they’re a snack in my book:) I love all the mix-ins! I’m all about texture! P.S. Your Grandpa sounds so sweet! I love the idea of ‘kitchen sink cookies’ where you can start with a base recipe and then let your imagination run wild! Grocery shopping on holiday is always the best too as you get to explore new stores and bring home lots of exciting goodies. Hope you have a great week, too, Charlotte! Thanks so much for your thoughtful comments! I loved that statement on cookies sweetened with stevia, protein powder, etc. it is so true! I don’t necessary dislike them, but you are right they are no cookie! Love the addition to butterscotch chips, one of my favs! I agree 100%! 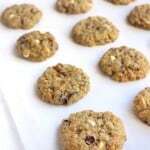 Healthy “breakfast cookies” with oats, PB, etc. are actually pretty good (as long as they have all real ingredients!) But not quite dessert. Totally agree with you that the “healthy” cookies never taste as good as the real deal. This recipe looks awesome and I can’t wait to try it! Would much rather have a few of these than lots of the healthy cookie stuff. I agree 100%! Thanks, Alyssa! Thanks, Liv, for posting the recipe. I think it will be fun to use the recipe trying different ingredients. Glad I could help inspire! ? Mmmm I would love to lick my sink. Er. Um. Er. No. LMFAO! But these cookies – yes! I think even the most unhealthy dishes can be considered healthy if they are good for your mental health and I think that cookies are most definitely good for your mental health. Haha! I like the way you think, Dannii. It’s all about moderation, anyway, right? YES! Kitchen sink recipes are my favorite. I tend to find some really tasty combos when I just throw everything in there. These cookies look so deliciously soft! Haha #teambutter all the way! YES!! These look amazing. And I agree! I would SO much rather eat a small portion of a rich dessert than tons of the low calorie substitutes. I’m right there with ya on the real-food train! YUM! Thanks for sharing 🙂 Hope that you’re having a great week! Thanks, Cailee!! Have a great WEEEKEND! the fact that these have three types of chips makes me drool! Real butter and sugar can never be replaced by protein powder! Love using a little bit of everything. Sometimes that leads to the best combo. YUM! Yeesss, I love this!! I love all these different chocolate chips, these must be so amazing and tasty! Why use one type of baking chips when you can use three, plus lots of other goodies, too?! Our grocery overloads with baking ingredients designed for Christmas baking. After Christmas, many of the ingredients in these cookies, also, go on sale. It is a good time to stop up on nuts, dark chocolate candy, and some fruits. I seem to be missing the link to click on to get the actual recipe?? Would love to make these for the holidays!! Kitchen sink cookies are my favorite! !